Welcome to the World of Slots! Since the invention of the first gaming machine, its popularity has been enormously increased. It is no surprise that players all over the world admiringly try to play slot machines in online and land-based gambling establishments. The simplicity of rules, glimmering and beeping accurate rows in casinos, attractive tasty prints on the reels: what can be more attractive (especially to a newcomer in gambling industry)? And it is true: gaming machines do attract gamers with various experience and bankroll limits. In order to enjoy slots, you need to make a right choice and pick up the right machine and the game that will suit your requirements. Below you will come across the classification of the major types of modern slots. Take your time and read it very attentively in order to get your money's worth the game. This is a very well-known type of slot machines connected in a single network and characterized by constantly increasing jackpot. The amount of the progressive jackpot is boosted with every user's bet until the lucky one hits it. Afterwards the jackpot is to be reset and is growing with every coin inserted in the machine over and over again. Many gamers use this slot type as a chance to scoop a large life-changing profit. 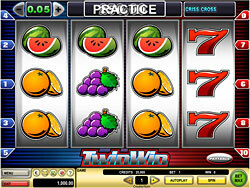 This type is widely spread classic category of casino gaming machines. Everything you need to do is to match combinations of various symbols on reels by pressing the button or pulling the handler. The payout table will inform you on the winning combinations and remuneration you will be able to obtain by having particular types of reels combination. Below you will read about the range of straight slot alternative games. Pick up the best suitable one! Multipliers are straight slots where the payout rate is changed in accordance with the number of coins you are using. Your total reward will be multiplied by the quantity of credits. This type of slot machines is very similar with the previous one but offer extra bonus in case you are playing the max number of credits. Read carefully the payout table in order to specify the amount of the available bonus. Buy a pay slot machine is a more complicated type of the straight slot machine. Gambler has a right to pay in order to unlock additional bets which give a chance to win with various winning combinations. The more money you deposit, the more winning lines are activated. This straight slot game involves additional wildcard symbol which can replace any other gambling symbol in order to build a winning matching line. As a rule wildcard symbol slots have a lower payout rates than other alternative games. So you'd better check the payout data first. Do not hurry, take your time in order to make a wise slot type choice and enjoy the game to the full extent. Good luck!